If doctors were able to pinpoint the mechanisms of IPF progression, it could unlock a wider range of treatment options for the future. Fortunately, many researchers are recognizing the potential of using mouse models to investigate disease mechanisms, which hold promise for uncovering histological characteristics of IPF that may lead the way towards viable targets in the search for next-gen IPF therapies. In fact, a recent study at Cedars-Sinai Medical Center began to uncover the molecules that drive IPF progression, suggesting that it might be possible to regress the disease through selective targeting of these players. Having previously demonstrated that chemokine receptor, CCR10, is highly expressed on the structural cells of patients with IPF, the Cedars-Sinai researchers furthered assessed this expression in vitro using explanted lung cellular suspensions of normal, COPD and IPF cells. Suspensions of the cells stained with fluorescently conjugated anti-CD45, -EpCAM, and -CCR10 antibodies were grouped using flow cytometry. FlowJo’s expanded gating tools, with multiple options to divide group cell populations for visualization and annotation, provided the analysis. The researchers found that there was a significant increase in the percentage of CD45-EpCAM+ cells and CD45-EpCAM+ cells expressing CCR10 in IPF samples (Figure 1A and B, quantified in Figure 1D and E). Further, the percentage of EpCAM-CD45-CCR10+ cells was significantly reduced in IPF lungs (Figure 1C, quantified in Figure 1F). This test suggests that CCR10-expressing epithelial cells are abundantly detected in IPF lung samples. Figure 1. (A–C) Normal, COPD, and IPF lung explant cellular suspensions were stained with fluorescently conjugated anti-CD45, anti-EpCAM, and anti-CCR10 antibodies and analyzed by flow cytometry. Dot plots A and B show a significant increase in CCR10+ on IPF CD45-EpCAM+ cells and CD45-EpCAM+ cells (quanitified in D and E). 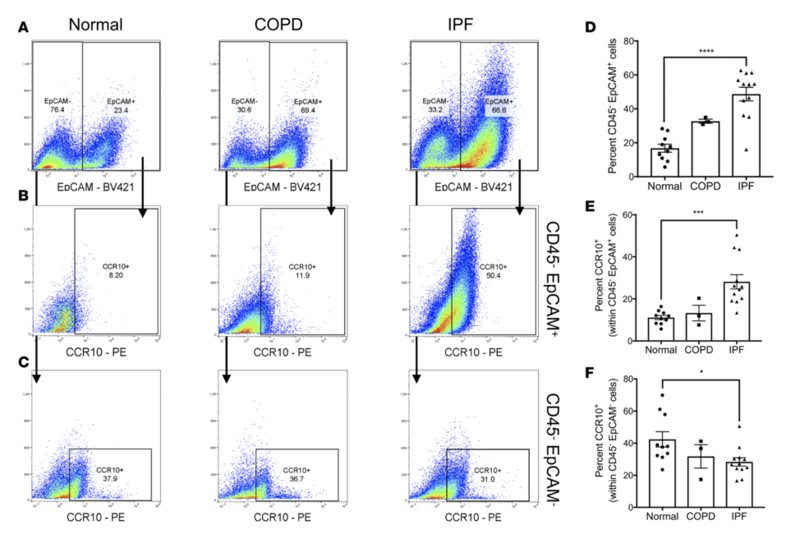 Meanwhile, dot plot C shows that EpCAM-CD45-CCR10+ cells were significantly reduced in IPF lungs (quantified in F). Then, to assess the role of these CCR10-expressing cells in remodeling of IPF lungs in vivo, the researchers cellularly administered IPF into humanized mice, and monitored them against naive mice. After 35 days, they found not only that the CCR10+ cells had engrafted into the mice lungs, but also that there was a significant increase in hydroxyproline (the molecule responsible for lung remodeling) concentration in the IPF lungs. These results suggest that CCR10+ epithelial cells may be promoting lung remodeling in humanized mice in some way. Then, through a number of in vitro culture techniques, the team found that intravenous administration of cultured IPF epithelial cells resulted in an increase in fibroblast invasion in the IPF affected lungs, which subsequently resulted in an increase in collagen 1 secretion in the lungs. Having uncovered the correlation between IPF epithelial cell administration, CCR10+ levels, hydroxyproline concentration and the promotion of lung fibroblast invasion triggering collagen 1 secretion, the researchers hypothesized that CCR10+ may be inherently profibrotic, and thus may contribute to the observed fibroblast activation. To test this, single-cell RNA sequencing of cultured CCR10+ expressing IPF epithelial cells was performed, which resulted in the identification of two distinct proinflammatory and profibrotic epithelial populations: KRT5+ (a basal cell marker) and SCGB1A1+ (a club cell marker) (Figure 2B). Figure 2. Single-cell RNA-seq analysis of EpCAM+CCR10+ and EpCAM+CCR10– epithelial cells shows unique epithelial cell populations enriched by CCR10. Two distinct subpopulations were identified, as demonstrated by circles in B. 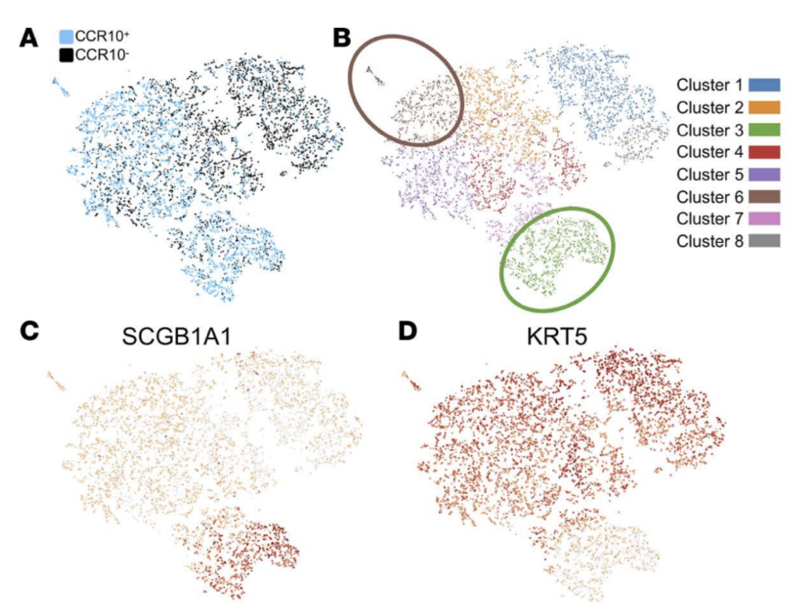 The subpopulations are individually depicted in C and D.
To investigate the transcriptome of EpCAM+ epithelial cells, researchers imported their scRNA-Seq data into SeqGeq and visualized the expression of CCR10, SCGB1A, and KRT5 on a tSNE map. The team discovered CCR10+ subpopulations expressing proinflammatory and profibrotic transcription profiles. They hypothesized that these distinct cell types may be responsible for fibroblast activation and key to understanding IPF progression. As a follow up to their previous research demonstrating that a subset of CCR10+ structural cells express the receptor tyrosine kinase, EphA3 (a putative pulmonary mesenchymal marker), the expression levels of EphA3 on CCR10+ cells in IPF samples was assessed. They found that the majority of epithelial cells highly expressing CCR10 also express EphA3, and activation of Ephrin A signaling induced further CCR10 expression on the same cells. Collectively, these findings describe a potential pathway for the remodeling of epithelial cells in IPF lungs. The results suggest that EphA3 signaling may be required to express or maintain the expression of CCR10 in IPF lungs. CCR10 signaling may then induce the secretion of fibroblast recruitment and activation, which secrete collagen 1, thus leading to lung remodeling and driving IPF disease progression. In light of this research, it is reasonable to hypothesize that the selective targeting of CCR10+ cells via EphA3 activity may be a viable treatment for regressing IPF.